We all have that dream list of items that we hope will land under our Christmas tree one year or show up at our doorstep as an awesome birthday surprise. Now you should be prepared to make that list a little longer with these luxury appliances that are a kitchen dweller's dream. Whether you've just moved into a new home and need new cooking gagets, or you're a master chef looking to expand your collection of culinary toys, these appliances are sure to take your kitchen from good to great!So, stop hoping and start running--to the store, that is, to buy them for yourself! Juicing has become a huge fad over the past few years, and rightly so. It’s fun to do, and it’s super healthy. A juicer is simple to use, but it does take a lot of produce to get a fair amount of juice. If you have a fruit tree or have veggie garden, this could be a great way to use some of your stock before it goes bad. Let your inner Italian artisan out with a pasta maker. You could be up to your ears in fettuccine, spaghetti, and penne. You can even experiment with different flavored pastas and have a rack to dry them on. This pasta maker comes with it’s own set of recipes to get you impressing your dinner guests faster. Who doesn’t want their own personal Ben and Jerry’s in their own kitchen? With this ice cream maker, the flavor combinations are endless. You can make traditional ice cream, frozen yogurt, sorbet, and sherbet, and top off your delicious creation with rainbow sprinkles! Start your morning off right with a fresh cup of coffee brewed from your own kitchen. With a coffee machine, you get to skip standing in line at the coffee shop and enjoy your favorite gourmet coffee just the way you like it without the wait. Some coffee machines are compatible with pod coffee making, whole beans, or ground beans, so choose the model that suits your preference. You can also get machines that double as tea makers, so the tea lover in your life is covered, too! Weekend barbecues just got a little more flavorful with this meat smoker. 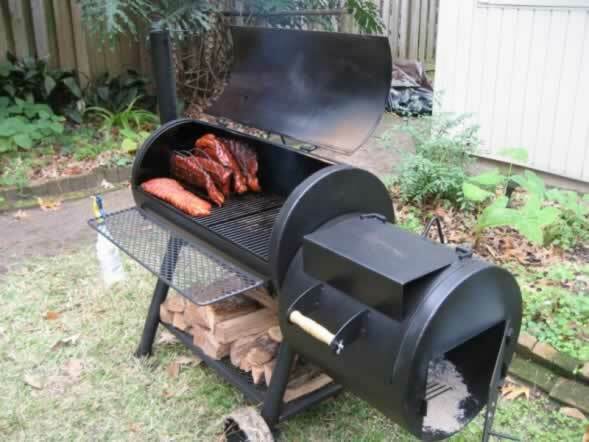 All you have to do is choose your meat and your type of wood to smoke with, and you’re up and running. This smoker works with wood pellets and has multiple meat probe inputs. Some of the more modern appliances have wireless capabilites so that you can check up on your meat from your electronic device. This is a great feature considering you can smoke meat for more than 24 hours at a time and don't always want to check on it over and over again. Just because you are lacking in outdoor entertainment space doesn’t mean you have to write s’mores out of your diet. You can make your guests feel like they are at a good ole' country bonfire with this indoor flameless marshmallow roaster. Break out the graham crackers, marshmallows, and chocolate bars for an indoor extension of summer treats! This automatic grocery list maker is every shopper's dream! It recognizes your voice and even prints out a list for you when you are ready to head to the store. You can mount it to the wall for hands free use, and it will begin to learn what your usual grocery categories are and sort them for you within the list. Don’t be tied to remembering to write it down later, just speak out when you notice you need something and be assured that this device will add it to the list. This portable ice maker is a must for anyone with outdoor entertaining space. Just picture this sitting poolside at your next summer get together. Instead of wet, grassy feet running in and out of the house for ice, they can come to this portable ice maker instead. Truly an inspired idea. For any wine enthusiast, a wine cooler is a dream kitchen appliance. This wine cooler holds 40 bottles and has dual temperature zones, allowing you to cool your red wines at one temperature and your white wines at another temperature. With this appliance, you will always be ready to host a fabulous party at a moment’s notice. A food scale is a kitchen must-have for any serious cook. Whether it is used to weigh produce or meats, this food scale will make sure you stick to exactly what the recipe calls for. Measuring cups aren't always precise; you have to make sure to fill the entire cup and flatten the surface so that you don't accidentally use too much of one ingredient. Food scales take the all the guesswork out of cooking new recipes. Get inspired by Pan-Asian cuisine with this natural carbon steel wok set. It can handle any stir fry dish you can think up, and it even has a tempura rack for your favorite sea foods. This set is is easy to use and even easier to clean.